FABulous Custom Executive Home with Easy Access to Tinker! 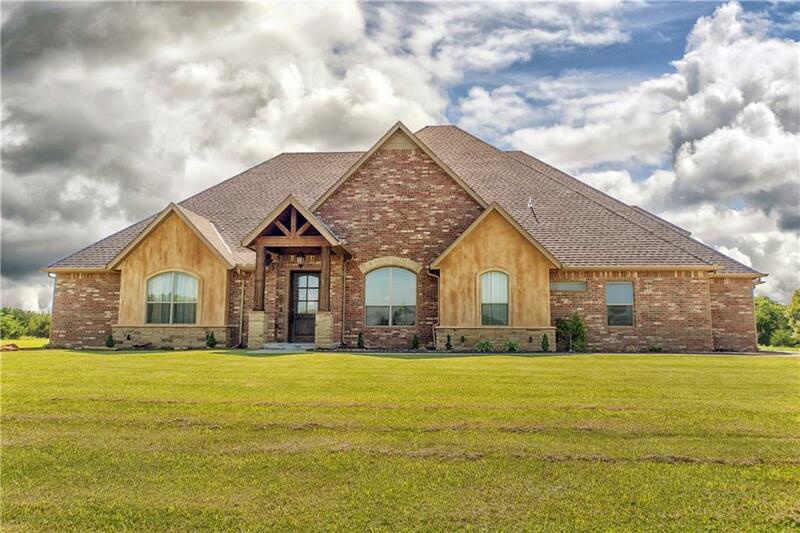 You'll Find Only Quality Craftsmanship in this Trails End Built Home! 8.23 Acres with a long, winding driveway, Mulch Gardens, 4 Car Garage & Blackberry Bushes Complement this Property. This Home Features Rich Wood Accents, Crown Molding, Granite Counter-tops thru-out, Stained Concrete, Hallway Built-in Armoire, plush carpet in the bedrooms, STUDY and a BONUS ROOM Upstairs! Upstairs you'll find a large room with plenty of space, FULL bathroom and storage area or bar. The Master Suite Boasts Cathedral Wood-Beamed Ceiling; Bathroom has Jetted tub, His & Hers Bowl Sinks, Tiled, Walk-In Shower w/ Rain showerhead & SUPER large Closet! The AH!mazing Kitchen boasts a BIG Pantry, Center Island, Tile backsplash, Pendant Lighting, Stainless Steel Appliances and the Utility room doubles as a Mud Room! Entertain in your Own Outdoor Kitchen - Includes TV, Fans, Firepit, Travertine Wall AND Extra Space to Par-Tay! Christmas Lights Package.